WinBubble is loaded with small tools that will help you maintain and tweak your Windows easily. Even if a virus removes several options through registry in your computer you can still access them through WinBubbles. This option will teach you how to change and edit your Windows Experience Index Score. MSConfig or System Configuration is a utility to troubleshoot the Windows startup process. In Windows 10, It provides a quick access to important tools for troubleshooting purposes such as UAC settings, Event viewer, Windows Troubleshooting program, System Properties and many more. Usually If your computer was infected by worms, Folder options will be disabled in your Control Panel or Windows Explorer Tools Menu. WinBubble will help you access the program easily. Secure Logon: Requires Users to press ctrl+alt+del during Windows Logon. This tool can changed the default font color and background color of the command line interpreter (cmd.exe). Great add-ons! This is a hidden secret option in Windows 10 that will help you access all the important settings in the Control Panel into one location or window. This is the famous tweakers library called God-mode. This is a utility in Microsoft Windows that can scan and fix corruptions to system files by drivers, viruses and softwares. Read here for more information. This option will flush the DNS resolver cache. Useful for troubleshooting DNS name resolution problems. If you downloaded some secret freeware application but you don't use it frequently, your desktop is full of icons and basically, you do not want to memorize lots of commands for tweaking and optimization. WinBubble Toolbox is great for you! Simply click the add your tools here option and add any programs that you want e.g. .exe, .reg, .bat, .cmd, vbs and others file extension. As long as it can be launch through Windows Explorer, you can add them also to WinBubbles. Using WinBubble, you can now set the options in just two Clicks. There are several useful features that WinBubble can do to your desktop and explorers right-click menu. WinBubbles for Windows 10 was designed and accompanied with icons that enriched a lot of user experiences. Solve problems – the easy way. Having some problems finding Control Panel items, Software and System tools? The new version will help you revive the Windows Aura that you always look for. This will solve the problem in "Access denied" message when opening / moving / deleting a file/folder. Increase productivity by speeding up arrangement of files and folders. *Turn Off your monitor when not in use to save battery. According to other people, despite the name - screen savers do nothing. Flashing images and Windows Aero especially LCDs and Displays actually consume more energy during active use. 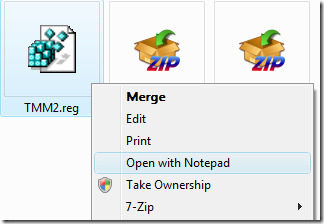 *Add "Open with Notepad" will greatly help you in everyday use of your computer. The freeware application is an easy to use tweaking tool that will help you in Branding your Windows computer. WinBubble will help you to change your Original Equipment Manufacturers Information and Logo without knowing the registry tricks. Using this tool you can now change and accurately input the Owner information after buying a new laptop/Tablet/PC. Trying to find what happen to the run window option at Start Menu? You already went on circles, until now you can’t find the said feature on windows and you want to get it back.